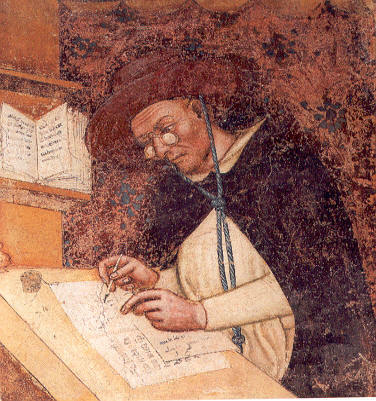 Contest Directions: The first eyeglasses were invented and made in Italy around 1280, and while their popularity grew, the first artwork that depicts sunglasses appeared only in 1352. It was a portrait of Cardinal Hugo of Provence at his writing desk, painted by Italian master Tomaso de Mondena. The reason why eyeglasses were very rarely used in portraits was that on the design side they were quite bulky and ugly. It was not til the 19th century that eyeglasses became stylish, modern, and popular so much that people liked to be photographed and painted with them. Let us show how famous paintings would look if characters there were depicted with eyeglasses (modern or antique). Please note that we focus on eyeglasses with lenses, not sunglasses. Please refer to the themepost example by Mundo. Gustav Klimt, The Kiss, 1907-8, oil and gold leaf on canvas. Wolfgang Amadeus Mozart, posthumous portrait by Barbara Kraft , 1819. You might move the frame up a little (so it isn't sticking in his ear. Well spotted MsgtBob  It was way past my bedtime when I created it. Fixed.